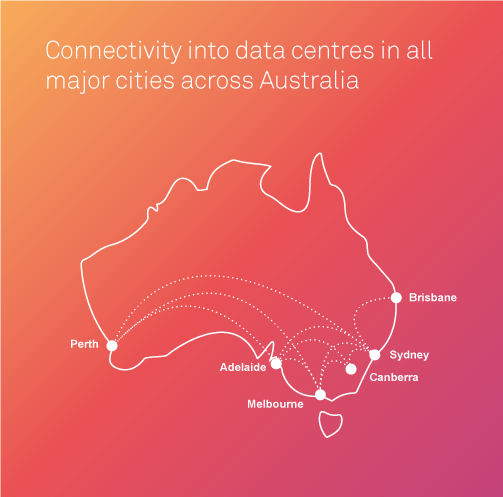 Our data centre footprint has expanded giving you connectivity into all major cities in Australia, now including Canberra and Adelaide. Using dedicated fibre optic infrastructure, Wavelength DCI has the power to service your customers with the cost-efficient, flexible connectivity they need to thrive. Installation is free and there are flexible contract options – simply let us know the extra bandwidth you require, and we’ll switch it on for you, as you need it. Plus, with our next-business-day delivery service, Wavelength DCI will help you deliver an always-on service to your customers. > Download the Wavelength DCI fact sheet. Want to learn more? Complete the form below and we will be in touch. In a world where the only constant is change, it pays to have a solution like Wavelength Data Centre Interconnect (DCI) supporting your business. Whether you need a month, a year or more of extra bandwidth, we’ll tailor our service to suit you. With free installation, you wont have to pay anything up front. By adding Telstra Wholesale to your portfolio, you'll boost business continuity through mitigating the risk of inconvinient carrier drop-out. With our next-business-day-delivery service, staying proactive for your customers has never been easier. Copyright © Telstra Corp 2017. All Rights Reserved.